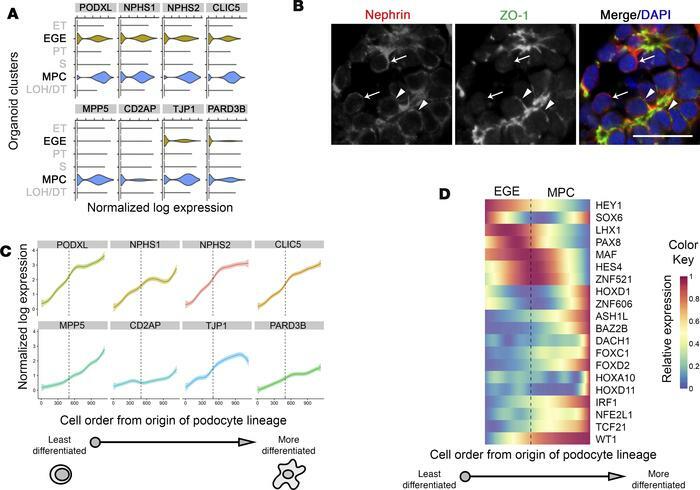 Cells farther along podocyte lineage trajectory are more mature. (A) Violin plots depicting expression of quintessential (top row) podocyte and (bottom row) epithelial cell polarity genes in organoid clusters from Figure 2C. Ticks on x axis indicate whole integers starting from 0 on the left of each plot. (B) Immunofluorescence confocal images showing protein expression in nascent podocytes in day-20 organoids. Arrows highlight nephrin+/ZO-1– cells, while arrowheads highlight nephrin+/ZO-1+ cells. ZO-1 (TJP1). Scale bar: 20 µm. Representative images of 3 independent experiments. (C) Average expression of indicated genes by cells along combined organoid-developing kidney podocyte lineage trajectory from Figure 3C using a curve-fitting method (GAM) with 95% CI represented by shading. (D) Heatmap of gene expression of transcription factors along the podocyte lineage trajectory as in C. Vertical dotted line indicates position at which podocyte and PEC lineages diverge (C and D). Gene names not italicized for ease of viewing (A, C, and D). See Supplemental Figure 2.